Today Diamond Systems Corporation, a leading global supplier of compact, rugged, I/O-rich embedded computing solutions for real-world applications in a broad range of markets, unveiled its compact, rugged HELIX PC/104 single board computer based on the DMP Vortex86DX3 system-on-chip (SoC) processor. Diamond Systems unveiled the Jupiter-MM-5000 high-efficiency, high-precision family of DC/DC power supply modules. These rugged I/O modules offer up to 218W of +5VDC / +12VDC / +3.3VDC power in either the compact PC/104 form factor or PC/104-Plus form factor. Jupiter-MM-5000 power supplies consist of a PC/104 form factor module with complete DC-DC voltage regulator circuitry, integrated thermal solution, detachable screw terminal block I/O connections, and PC/104 bus connectors. The wide input voltage range of 7 to 34VDC is compatible with industry standard 12V, 24V, and 28V inputs. The Jupiter-MM-5000 delivers efficiency as high as 95 percent, reducing input power requirements as well as heat generation. The full featured Jupiter-MM-5312 models include a system controller that offers advanced configuration, control, and monitoring features. Diamond Systems Corporation unveiled the Jupiter-MM-5000 high-efficiency, high-precision family of DC/DC power supply modules. These rugged I/O modules offer up to 196W of +5VDC and +12VDC power in either the compact PC/104 form factor or PC/104-Plus form factor. Jupiter-MM-5000 power supplies consist of a PC/104 form factor module with complete DC-DC voltage regulator circuitry, integrated thermal solution, detachable screw terminal block I/O connections, and PC/104 bus connectors. The wide input voltage range of 7 to 34VDC is compatible with industry standard 12V, 24V, and 28V inputs. The Jupiter-MM-5000 uses a state-of-the-art design with the latest generation high efficiency components. It delivers efficiency as high as 95 percent, reducing input power requirements as well as heat generation. Diamond Systems Corporation, a leading global supplier of compact, rugged, I/O-rich embedded computing solutions for real-world applications in a broad range of markets, unveiled the Janus-MM-LP family of CANbus 2.0 I/O modules, featuring independent isolation for each port plus data rates up to 1Mbps. 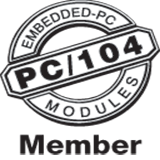 These rugged I/O modules offer 2 or 4 CAN ports and are available in the compact PC/104 and PC/104-Plus form factors. Today Diamond Systems Corporation, a leading global supplier of compact, rugged, I/O-rich embedded computing solutions for real-world applications in a broad range of markets, unveiled the Epsilon-24000 family of gigabit Ethernet switches. These rugged, managed Layer 2+ Ethernet switch modules offer up to 24 10/100/1000 Mbps copper twisted pair ports plus two small form factor pluggable (SFP) sockets in the compact PC/104 form factor measuring 4.5 x 3.8 inches (96 x 116 mm). Vega is a COM-based, highly integrated single board computer family featuring interchangeable COM Express COMs for scalability and long product life, high feature density in a compact size, integrated high-quality data acquisition, expandable I/O, conduction cooled thermal solution for improved reliability, and rugged construction. The DS-MPE-DAQ0804 offers 8 16-bit analog input channels, 4 16-bit analog output channels, and 21 configurable digital I/O lines in a PCIe MiniCard form factor with an extended operating temperature of -40oC to +85oC. Diamond Systems introduced a rugged, low cost 4-port multiprotocol opto-isolated serial port module in the popular PCIe MiniCard form factor measuring 30 x 51mm. The DS-MPE-SER4OPT offers 4 RS-232/RS-485 opto-isolated serial ports in a PCIe MiniCard form factor.